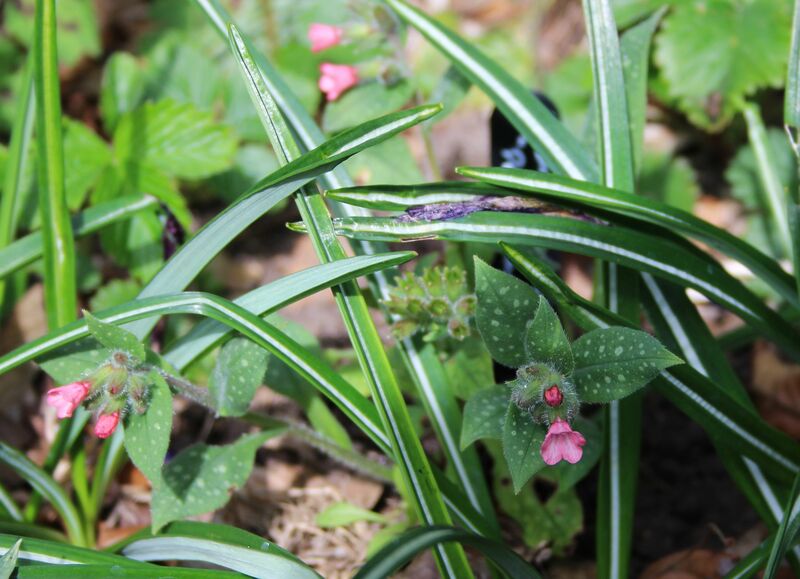 Pulmonarias – or “Spotted Dogs”? My first (happy) meeting with Pulmonaria flowers was in a car park in Blakeney, North Norfolk, UK. The whole of the front of the hotel we were staying at was planted with the pink and blue beauties and the bees were having a real party! Since then I have been smitten. Over the last few years I have collected several which I’d like to show you… some remain unidentified, but the more recent ones have been carefully labelled. One of these was the first to open in my garden this spring; “Sissinghurst White”. It has freckly, silvery green leaves and is a small and upright specimen. It has been flowering for about 3 weeks now. 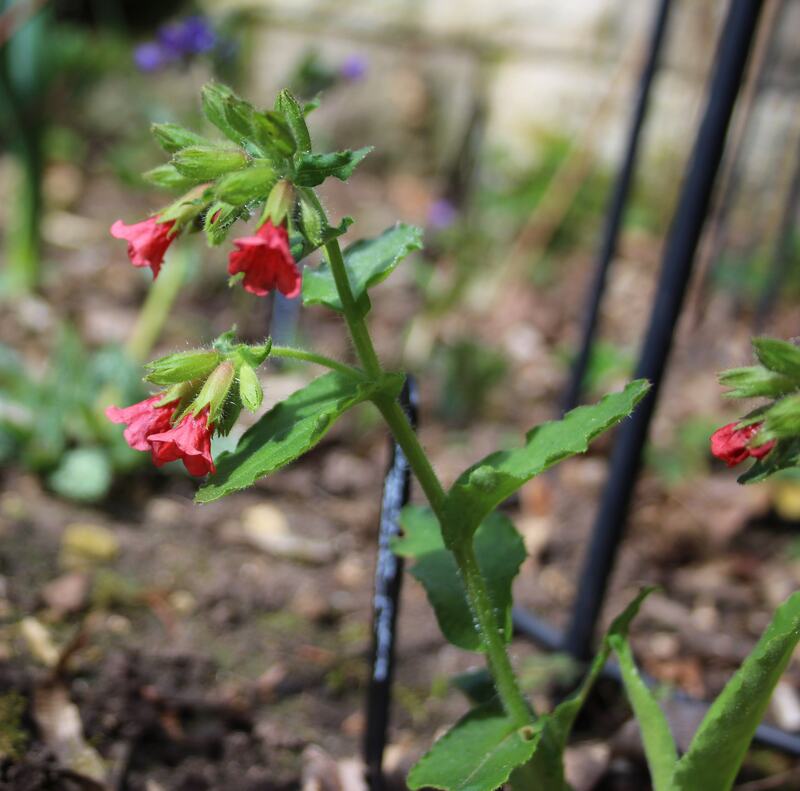 The next to open was one of the unidentified ones picked up from a garden centre, helpfully labelled “Pulmonaria”! It is situated in a very dry spot in full sun, but seeded itself there and seems very happy. The tiny flowers change colour as they age, not fading but often becoming more vibrant. And the foliage, in various shades of green, both with and without silvery freckling, is an attractive extra, especially before and after the flowers appear. I have been very impressed with the plain-leafed “Azurea” below, which has flowered well and put on a lot of new growth. A mild winter seems to have helped them all, and I will have to make sure they get some water in the summer occasionally too. In an extremely dry and hot garden like mine in summer it is a good idea to find spots where other plants provide shade later in the year. I remarked a couple of weeks ago that the P. angustifolia “Azurea” is the only one I had seen with plain, unfreckled leaves…. well, I hadn’t been looking very closely! 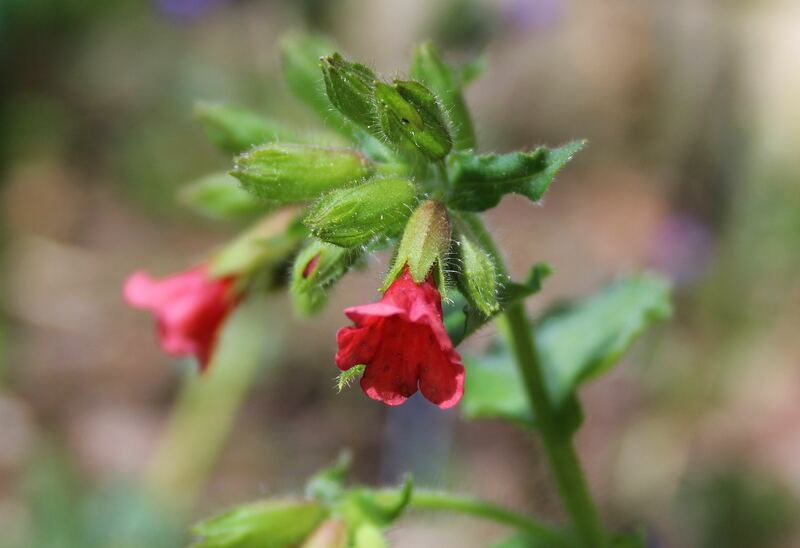 I have since found two others in my garden that are not spotted; Pulmonaria rubra ‘Redstart’ was a new addition to my garden last autumn and is doing well. 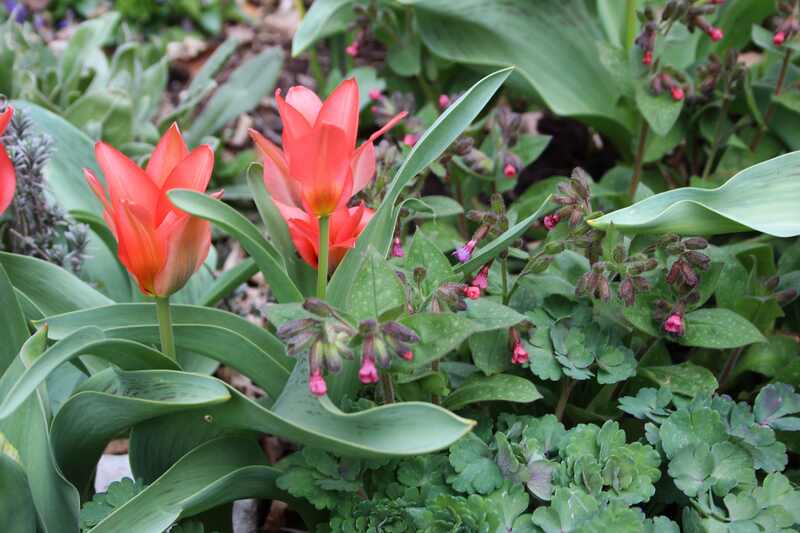 Its flowers really are red, with no hint of pink, and the plain pale green leaves are not as elongated as most. I have really fallen for Rubra! Pulmonaria should have a much prettier name; something evoking images of fairies and petticoats, candy and pearls. Just recently Steve at Portraits of Wildflowers found some more common names for me from Wikipedia, one of which I found quite cute: “Spotted Dog“. Still not quite fitting I feel, but fun! Some other common names are, apparently, soldiers and sailors (the two hues of colour on each flower reflect the uniform colours), Joseph and Mary, Jerusalem cowslip, oak lungs, spotted comfrey, and Bethlehem sage. Some German common names include Hansel and Gretel, Adam and Eve, blue cowslip, deer cabbage (Hirschkohl), and baggy trousers (Schlotterhose)…. Which name do you think suits them best? 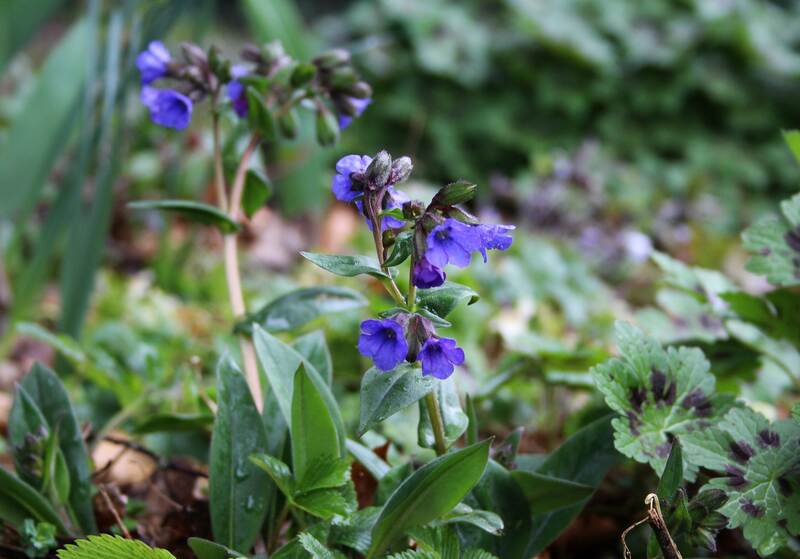 Do you grow Pulmonarias? Please share your photos too! This entry was posted in Garden, Nature, Plants and tagged Garden, Language, Nature, Plants, Spring. Bookmark the permalink. i don’t think I’ve ever run across these beautiful plants! I can totally understand why you fell in love with them! That is one advantage of us having a colder climate! 😉 Glad you like them! I can see why you like them so much Cathy; and they grow well for you which is the most important thing. I’m not sure about a common name, what about shady jewels? That’s a nice suggestion. Yes, something with “jewels”. I had one that was called “Opal” some years ago – a lovely pale bluish white, but it turned pink the next year! I love P. Sissinghurst White but unfortunately it never lasts long with me, I also love the deep blue of P. Azurea. They are very promiscuous though and will cross with each other while your back is turned! Mine is in its second year. Yes, I’ve noticed that tendency too – I had another two different blue ones, but one just disappeared and the other didn’t stay blue! Blakeney is lovely, a favourite place to visit. I really like Sissinghurst white, for a common name from the list, I quite like Bethlehem sage, but none really do this plant justice. Must be great for the bees, so early in flower, I must look them up locally. Yes, the bees love them and spend ages in each little flower. Hope you find some near you. I can see why you like “Rubra”… and “Trevi Fountain” too – really pretty flowers. Not sure about the names, Hansel and Gretel sounds interesting – is there a story behind that? I love Blakeney too. We use it as a lovely centre for a cycling holiday on the lanes of Norfolk. I have lots of named Pulmonarias and they have had loads of babies which are all different and all lovely. Another Blakeney fan! 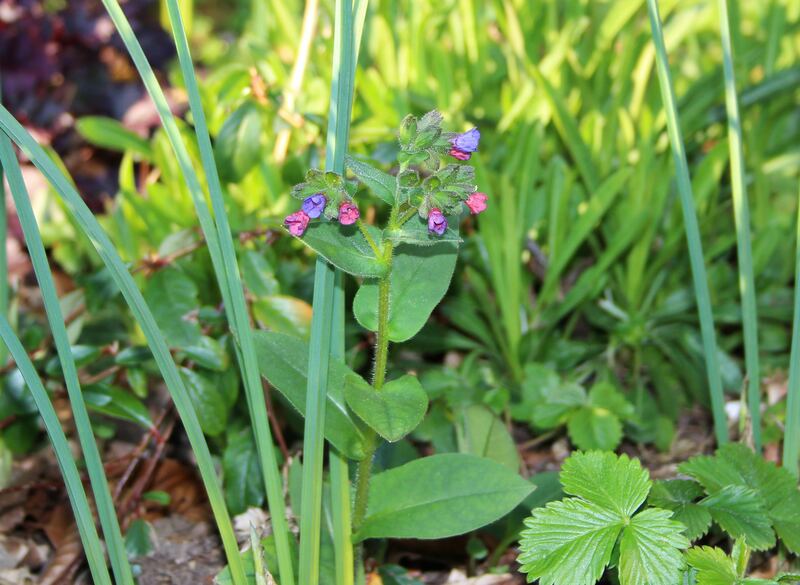 Yes, I love the way the Pulmonarias just spread, regardless! Cool- i didn’t know that about the hansel and Gretel name! You have quite a nice selection, I love how they blend into a wildflower tapestry in spots. I should look into these again, not quite sure why I don’t have any! They fit into a spring garden perfectly – I like the way the flowers draw me (and the bees) to them! They like a bit of shade, although mine are all in pretty sunny spots, and I have had to water one of them as it has been so incredibly dry… forest fire alert level 4 (out of 5) in April! Nice collection you’ve amassed Cathy. I like these very much, but haven’t not been successful with them. Perhaps it’s too warm for them in your climate? They do tend to disappear occasionally in my garden too, but others then seed themselves and keep up the population. Have a nice weekend Susie! I am always on the look-out for more varieities, but they cross-pollinate all the time, so it doesn’t really matter what sort I have! I would love to see a really good collection of them but haven’t heard of anywhere they concentrate on them. Thank you Gina. 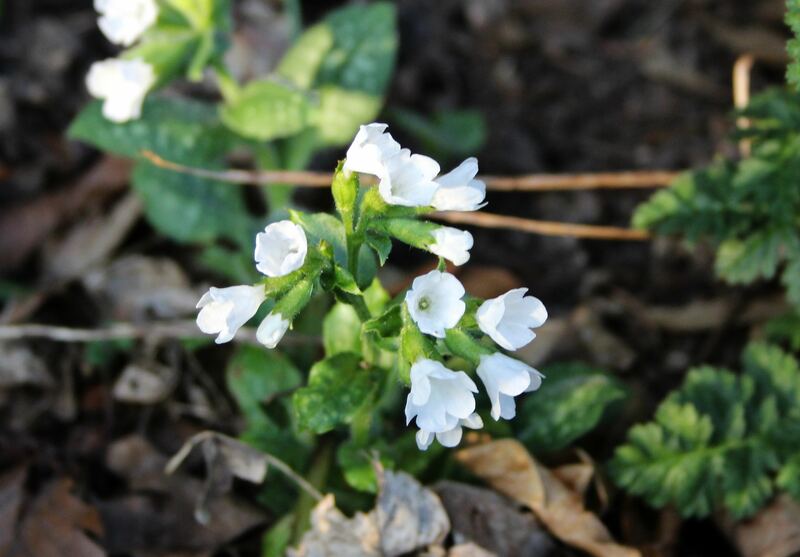 Yes, lungwort is such an ugly name! Oh I most fond of pulmonarias too Cathy. The bees enjoy them too, the foliage interest lasts for ages and the molluscs don’t nibble. What’s not to like? Interesting to read the German common names. I will try and post some photos of mine soon. That’s another point in their favour that the snails don’t like them. We haven’t seen any snails and slugs yet though, due to the dry weather – my parsley has been allowed to get a headstart! Hello Cathy! lovely flowers, your garden looks great! I am not too sure about having a snake around. I wasn’t about to tell what kind of snake it is, do you know? Do you have a lot of snakes? I would vote for blue cowslip. Most of the others are not too appealing. Soldiers and Sailors – huh? Yes, some of those names are rather strange! 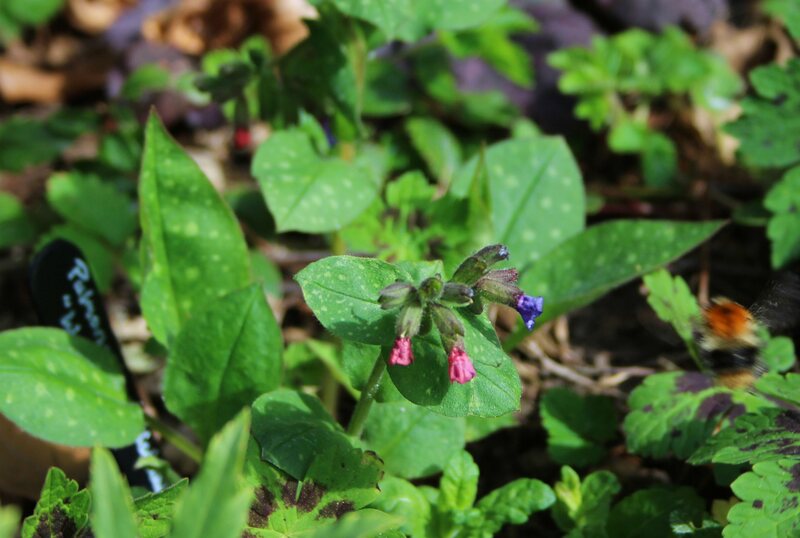 Blue cowslip and Hansel and Gretel are good contenders for an alternative to lungwort! Lovely things in your garden. 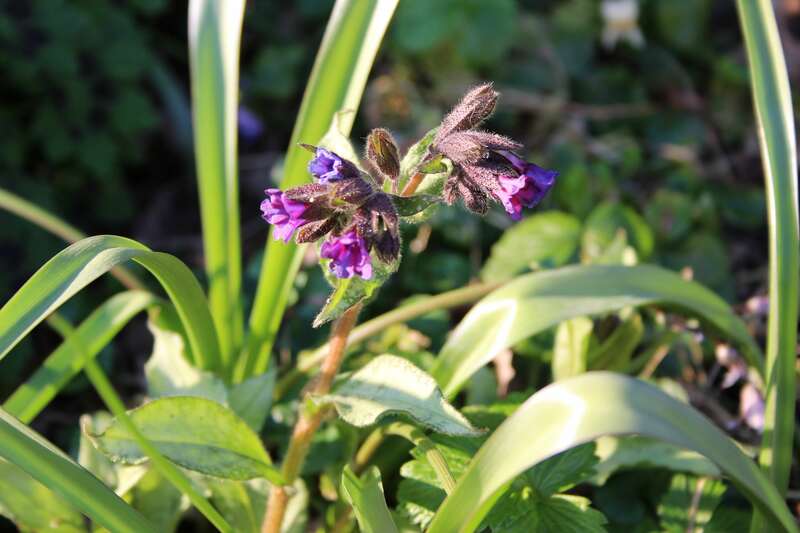 I do love pulmonaria, you’ve reminded me I need more in my garden – and I like the ring of Jerusalem cowslip. Definintely more appealing than lungwort. Oh, very pretty! I tried some of these in my garden, but they didn’t do well – maybe too hot for them, or not cold enough in winter? Hopefully it just wasn’t me! 😉 I think I like your Trevi Fountain best – what a gorgeous blue, and I like the spotted leaves. But I was not ready for the snake! Eek! The Pulmonaria do appreciate some shade and moisture, but don’t need a cold winter as far as I know. And it’s only a harmless lizard! 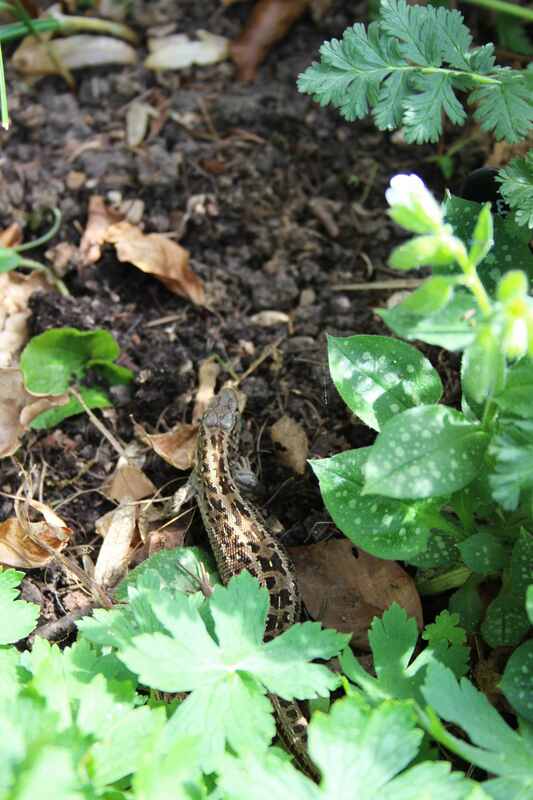 We do have snakes – harmless too – but I have rarely managed to get close enough to one for a photo! My mother goes all out to try to capture the best of an English cottage garden. She does well, although I am sure I would be stunned at a true English garden. This is still hot and dry California. I have never seen these little flowers before, and judging by all the names, I’ll have to research a bit to see if they’re even available here. But I’d love to surprise her with a specimen or two. They are so sweet, and really look like a flower she’d fully appreciate. The names are just wonderful. Baggy trousers? Isn’t that so funny! I think I’ve seen Moonshine – really silvery leaves?… They are pretty tough little plants and there are so many different varieties. 😀 Thanks for visiting! Hi Cathy, you have really got the bug!! I love “Trevi Fountain”, that may go on my wishlist. 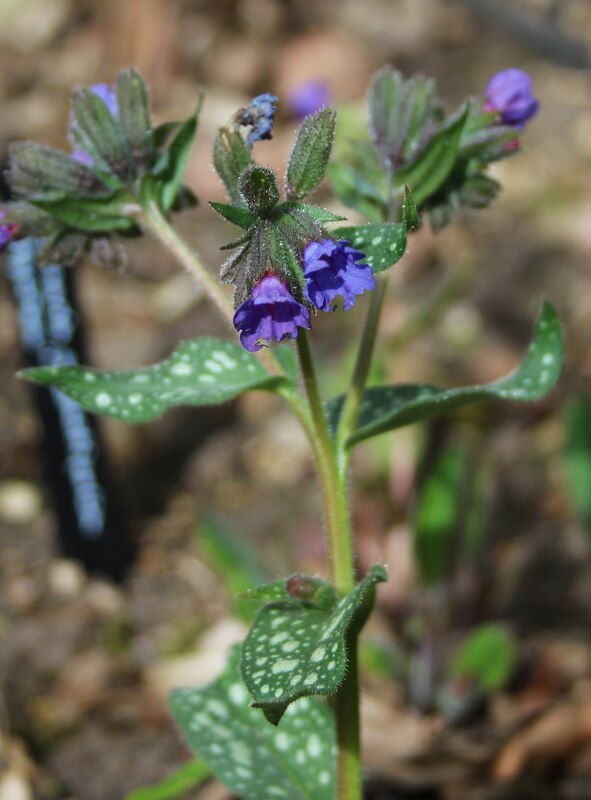 They are new to me, pulmonarias, I inherited a freckle leaved variety when we moved here and have had to move it so I was delighted to see it flowering its socks off this Spring. I could certainly see myself catching your pulmonaria habit. Yes, I may start collecting some more this year… Isn’t it strange how each gardener has their own little favourites, often quite obscure…. my Mum loves auriculas for example, but I find them hard to even like! A friend of mine divided her pulmonaria last year and I was the lucky recipient of a piece of it…unfortunately, she didn’t know the cultivar. I suspect it may be ‘Mrs. Moon,’ but I may be wrong. Hopefully it survived the winter! I can see why you are collecting them – there’s so much to love about them! I’m particularly taken with that ‘Rubra’ – how pretty!